For more than a century England had possessed thirteen colonies stretching along the coast between Canada and Florida. The British Parliament made laws that benefited the English merchants, and by 1750 had passed many laws to encourage trade with her colonies. Some of the laws forbade them to trade with other countries or even, in some cases, with one another. Had all these laws been rigidly carried out, the great Revolution might have come before it did. This is a timeline of events through the Revolutionary War which would see a Nation’s birth and the world’s beacon of Freedom. April 14, 1775 – Massachusetts Governor Thomas Gage is ordered by the British to enforce the Coercive Acts and suppress any rebellion among colonists by using all necessary force. April 18, 1775 – General Thomas Gage orders 700 British soldiers to Concord to destroy the colonists’ weapons depot. Paul Revere and William Dawes are sent from Boston to warn the colonists. Samuel Adams and John Hancock, who are hiding in Lexington, Massachusetts are able to escape. 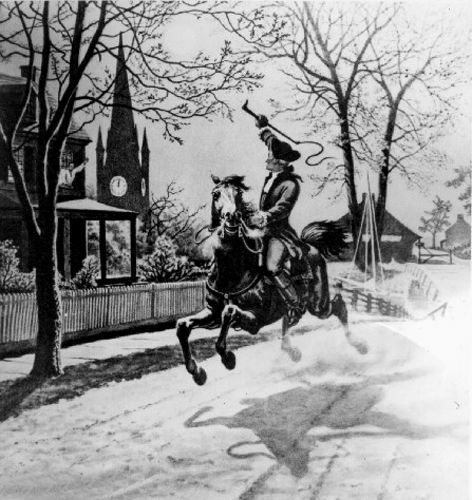 April 19, 1775 – First shots fired in the American Revolution at Lexington, Massachusetts. 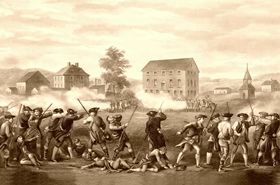 April 19, 1775 – American Militia defeated British regulars at Concord, Massachusetts. April 23, 1775 – The Provincial Congress in Massachusetts orders 13,600 American soldiers to be mobilized. Colonial volunteers from all over New England assemble and head for Boston and begin a year long siege of the city. May 10, 1775 – The Second Continental Congress convenes in Philadelphia, Pennsylvania with John Hancock elected as its president. May 10, 1775 – American forces led by Ethan Allen and Benedict Arnold capture Fort Ticonderoga and its artillery in New York. May 15, 1775 – The Second Continental Congress places the colonies in a state of defense. Battle of Lexington, April 19, 1775. illustration by John H. Daniels & Son, 1903. Click for prints & products. June 15, 1775 – The Second Continental Congress unanimously votes to appoint George Washington general and commander-in-chief of the new Continental Army. June 17, 1775 – The first major fight between British and American troops occurs at Boston, Massachusetts in the Battle of Bunker Hill. July 3, 1775 – General George Washington assumes command of Continental Army, about 17,000 men, at Cambridge, Massachusetts. July 5, 1775 – The Continental Congress adopts the Olive Branch Petition which appeals directly to King George III for reconciliation. July 26, 1775 – An American Post Office is established in Philadelphia, Pennsylvania with Benjamin as Postmaster General. August, 1775 – King George III refuses even to look at the petition submitted by the Continental Congress and instead issues a proclamation declaring the Americans to be in a state of open rebellion. November 10-21, 1775 – Patriots are sieged by the British at Ninety-Six, South Carolina. Ended in truce. November 28, 1775 – The American Navy is established by Congress. November 29, 1775 – Congress appoints a secret committee to seek help from European nations. December, 1775 – Congress is informed that France may offer support in the war against Britain. December 11, 1775 – Virginia and North Carolina patriots routed Loyalist troops and burned Norfolk. December 22, 1775 – At Great Canebrake, South Carolina Colonel William Thomson with 1,500 rangers and militia captured a force of Loyalists. December 23, 1775 – King George III issues a royal proclamation closing the American colonies to all commerce and trade, to take effect in March of 1776. December 23-30, 1775 – During the Snow Campaign in South Carolina against Loyalists, Patriot militia is impeded by 15″ of snow. February 27 1776 – North Carolina militia defeated South Carolina Loyalists at Moore’s Creek, North Carolina inflicting heavy casualties. March 4-17, 1776 – At Dorchester Heights, Massachusetts, American forces capture Dorchester Heights which overlooks Boston harbor. The British evacuate Boston and set sail for Halifax. March 17, 1776 – British Navy evacuated Boston, Massachusetts and moved to Halifax, Nova Scotia, Canada. Washington’s Army then occupies Boston. April 12, 1776 – The North Carolina assembly is the first to empower its delegates in the Continental Congress to vote for independence from Britain. May 2, 1776 – The Continental Congress gets the much needed foreign support they had been hoping for. King Louis XVI of France commits one million dollars in arms and munitions. Spain then also promises support. May 10, 1776 – The Continental Congress authorizes each of the 13 colonies to form provincial governments.